The Welsh couple Angie and Phil had sent us an Email, that there are King Penguins at Bahia Inutil, some kilometers East of Porvenir (GPS coordinates S53° 27.380 W69° 18.141). Thank you very much Angie and Phil. 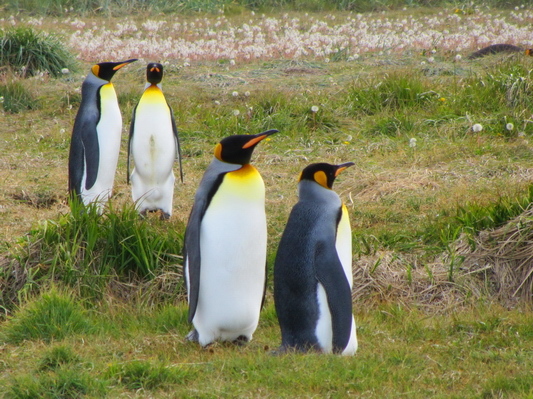 The King Penguins had established this colony just two years ago and they were just few but this might be the only opportunity to see them outside of the Falkland islands and Antartica. The entrance was expensive, we payed 25 Dollars per person. But we were guided very well, we came incredible close to the Penguins and learned a lot about them. We continued on the next day along the Bahia Inutil to the little village Cameron, where we asked someone about the further road condition to Puerto Arturo on the Canal Whiteside. He directed us to another house and a man came out, who spoke English fluently. He told us a lot about the shape of different roads and his Estancia (estate), which is quite large. He phoned several times the Police if the direct route to Rio Grande in Argentina is open already, which was not the case. Finally it turned out that this was Senator Carlos. Thanks to Senator Carlos we drove with our car to Cabo Nose on the Southwest end of Bahia Inutil. It is a very remote but stunning area with fantastic views. After Cabo Nose the road became very rough. Tommy and Alfred continued per bicycle few kilometers to Punta Yartou with its antique Whale processing port and plant. But there was life not far away from the ruins like many birds, rabbits, geese and ducks. Tierra del Fuego had suffered a short but hefty gold rush at the end of the 19th century. Remains are still visible. Lago Blanco is a beautiful lake in a pristine environment. Our free campground on its beach provided splendid views. We continued the very good gravel road to Lago Fagnano over two passes. From the first one (GPS coordinates S 54° 20.280 W 68° 49.448) we did a short hike to the highest mountain East of it. 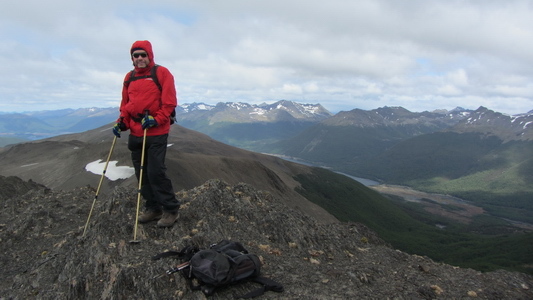 We named this 885 meters high mountain Cerro Deseado (GPS coordinates of the summit S 54° 20.246 W 68° 47.873), because the lake on its food is the Lago Deseado. Our track is included in the GPS coordinates file of Chile. Our idea was to hike few kilometers from the western end of the huge lake Lago Fagnano to Caleta Maria, the innermost part of the fjord Fiordo Almirantazgo. But when we came to the lake we were stopped by military. They asked about our permission, which we should obtain in Punta Arenas. Of course we had not and Punta Arenas is more than 300km away. Now we understood why the street was in such a good condition. Back we saw a lot of dams build by Castors. Unfortunately there are so many that severe damages are visible. They have no natural enemies in Tierra del Fuego, so they were and are propagating constantly since the first Beavers were brought in the 1950s. The idea was to hunt them for the furs, which never happened in bigger quantities. Our first puncture with this car happened in the middle of nowhere between Rio Grande (Chile) and Rio Chico. We thought no big deal because we have a spare wheel. But we were shocked when we dismounted the spare wheel from the rear bottom of the car: The rim was totally corroded where it was touching the retaining bracket. Our car is 18 years old and it we had the feeling that the spare wheel was never, never used. We drove some kilometers with our weird spare wheel but it was loosing permanently air thanks to the rotten rim. At Rio Chico two German guys helped us with their MAN truck because they had an air compressor. But we had no chance, because both wheels lost air rapidly now. There was some construction work on the bridge over Rio Chico. The working people realized that we had some trouble. Fortunately one man spoke perfectly German, because his family had migrated from Austria. He took the wheel with the good rim to his car and ensured us that we get it back fixed in the next morning at 10:00AM. We asked about the price, but he insisted that this service was free of charge. Of course we got back our wheel as promised - Muchas, muchas Gracias. In the late afternoon some animals came out of their den. We thought that we get a new rim in Argentina, because Volkswagen is very popular there. We were spending a whole day in Ushuaia in car spare part shops and Gomerias (tire services) to look for a substitute. Everybody jacked up the car and tried his set of spare rims. Sometimes the distance between the screws was to short, sometimes the inner whole to small and so on. Delivery of a new rim needs several weeks because it has to go by ship from Buenos Aires due to the borders with Chile. There is no direct street connection between continental Argentina and Tierra del Fuego without crossing Chile! No chance and finally we agreed on the Argentine way: Usage of a tube, rasping the corrosion and smoothing it with a piece of rubber between the rim and the tire. It seems to work but we hope that we never need it. For sure we will check in the next bigger city in continental Argentina for a new rim.